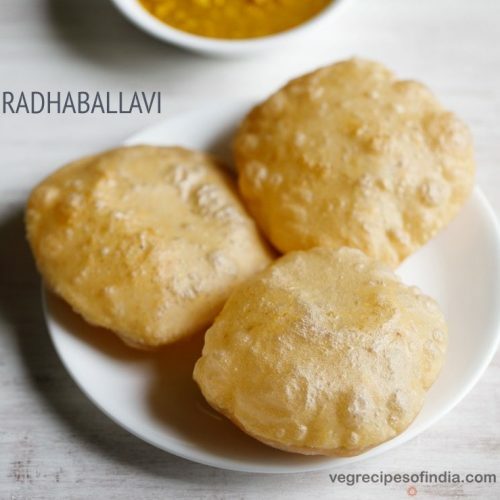 radhaballavi also known as radhaballabhi are tasty dal puris. these soft pooris are stuffed with a spiced dal filling. take 1 cup all purpose flour (maida) and 1 cup whole wheat flour (atta) in a large bowl or parat (wide plate). add 2 tablespoons ghee and 1 teaspoon salt. mix the ghee and salt very well with the flour. then add ⅔ to ¾ cup water in parts. knead to a smooth pliable dough. cover with a moist cloth and let the dough rest for 30 minutes. heat a pan or kadai. keep the flame to a low and add 1 teaspoon fennel seeds and 1 teaspoon cumin seeds and stir. then add 1 to 2 dry red chilies (broken and seeds removed). stir often and roast the spices till they become aromatic. do not burn them. switch off the flame and then add 2 thin strands of mace and stir. then let the spices cool down. once the spices cool down, take them in a spice grinder or a small grinder jar. grind to a fine powder. keep aside. meanwhile, rinse ½ cup urad dal in a bowl. add 1 cup water and soak urad dal for 4 to 5 hours or overnight. before you begin to knead the dough, you have to soak the urad dal for some hours or overnight. later drain all the water and keep aside. now take the urad dal in a grinder jar. also add 1 inch ginger (roughly chopped). add 3 tablespoons water and grind to a semi-coarse consistency. do not make too coarse or too fine. keep aside. heat ½ tablespoon ghee in a heavy kadai or pan. keep the flame to a low or switch off the flame. then add a generous pinch of asafoetida (hing). stir well. then using a spatula add the ground urad dal paste. mix very well on a low flame. then add 1 teaspoon sugar and salt as required. saute with non-stop stirring for 3 to 4 minutes on a low flame or till the mixture begins to gather around itself. then add the ground spice powder. mix very well and switch off the flame. check the taste and if required you can add more salt and sugar. let the mixture become warm or cool down. then form small to medium sized balls of the urad dal stuffing. cover and keep aside. if the mixture feels sticky, then apply some oil or ghee on your palms and then make the balls. after 30 minutes, divide the dough into 10 to 12 balls. cover them with a moist cloth and keep aside. take one ball and spread a bit of oil on both sides. flatten it with your fingers or with a rolling pin. place the urad dal stuffing ball on the dough and flatten the urad dal stuffing ball slightly. bring the edges of the dough together. then begin to join the edges at the center. excess dough can be pinched off and removed. seal well and ensure that the poori does not have cracks. then gently roll the poori with a rolling pin to get a medium to slightly thin poori. you can stuff and prepare all pooris this way. keep them covered under a moist muslin or cotton cloth, so that they do not dry up. heat oil for frying and keep the flame to medium. to check the temperature while frying, add a small piece of dough to the oil. if it comes gradually & steadily to the surface, then the pooris are ready to be fried. if the dough comes quickly, the oil is too hot. so lower the flame. if it does not come on the surface, then the oil is cold. so increase the flame. gently slid or place on poori in medium hot oil. after a few seconds, the poori will come up and start puffing. gently nudge each poori with a spoon, so that it puffs up well. fry till the base becomes light golden. then gently turn the poori with a slotted spoon. fry the second side also till it becomes light golden. gently press the sides with the slotted spoon while frying so that the edges are also fried well. remove radhaballavi with a slotted spoon and drain the excess oil back in the kadai. place radhaballavi on kitchen paper towel so that excess oil is absorbed. fry all the dal pooris this way. serve radhaballavi hot or warm with bengali dum aloo or cholar dal.